Zambian AIDS activist Winstone Zulu died on 12 October 2011. Zulu was for a time taken in by Thabo Mbeki's AIDS denialism -- and nearly died as a result -- but became a tireless campaigner against denialism and for people living with HIV/AIDS after antiretrovirals restored his health. Below is the Treatment Action Campaign's tribute to Zulu. Also see the Treatment Action Group's statement. We express our condolences to Winstone's family and friends. Winstone was a leading figure in the Network of Zambian People Living with HIV/AIDS (NZP+) and one of the founders of the Pan African Treatment Access Movement. We wish to pay tribute to Winstone by recalling his struggle with and against AIDS denialism. Winstone was open about his HIV status from the early 90s. In 1997 he started taking antiretroviral treatment. A study by two AIDSTruth contributors, Nicoli Nattrass and Eduard Grebe, has shown that belief in AIDS origin conspiracy theories like those promoted by AIDS denialists are associated with lower rates of condom usage among young adults. In addition, the study showed that young adults who trusted the denialist South African health minister (Manto Tshabalala-Msimang) more than her non-denialist successor were substantially more likely to believe conspiracy theories, while those who were not familiar with the denialiam-fighting activist group the Treatment Action Campaign were more likely to believe conspiracy theories and less likely to use a condom than those who were. This study adds to the evidence that state-supported denialism likely resulted (and continue to result) in unnecessary HIV infections in South Africa. Readers without subscriptions can access a preprint of the article. This note first appeared on a Facebook page. It is republished here with the author's permission. After speaking with Shannon, we decided it would be beneficial to those interested in Kim's history to hear my own personal story. Mills EJ, Bakanda C, Birungi J, Mwesigwa R, Chan K, Ford N, Hogg RS, Cooper C.
aFaculty of Health Sciences, University of Ottawa, Ottawa, Canada bThe AIDS Support Organization (TASO), Headquarters, Kampala, Uganda cBritish Columbia Centre for Excellence in HIV/AIDS, Vancouver, Canada dMédecins Sans Frontiers (MSF), Geneva, Switzerland eDivision of Infectious Diseases, The Ottawa Hospital, Ottawa, Canada. OBJECTIVE: Evaluations of CD4 cell count and other prognostic factors on the survival of HIV patients in sub-Saharan are extremely limited. Funders have been reticent to recommend earlier initiation of treatment. We aimed to examine the effect of baseline CD4 cell count on mortality using data from HIV patients receiving combination antiretroviral therapy (cART) in Uganda. DESIGN: Observational study of patients age ≥14 years) enrolled in 10 clinics across Uganda for which TASO has data. Witwer and Kalichman's piece is embedded below. What we know about AIDS explains the essential science of HIV succinctly and clearly. It was originally published as a chapter in Debunking Delusions by Nathan Geffen. With the permission of the author, Nathan Geffen, and the book's publisher, Jacana, we are now releasing this chapter under the Creative Commons Share-Alike 3.0 Unported license. Please feel free to copy and distribute it. You are also allowed to modify it under the terms of the license. Debunking Delusions can be purchased online from amazon.com and kalahari.net. Go to AIDSTruth's page for What we know about AIDS. Denialists frequently cite the well-known phenomenon of some individuals with HIV living healthily for long periods without treatment as evidence that HIV does not cause AIDS. However, the existence of these rare individuals do not in fact disprove the science on HIV/AIDS. We debunked that myth here. Also, despite denialist claims to the contrary, research on how these individuals' immune systems control HIV for longer than usual has in fact been a priority and several studies have shed light on the mechanisms involved. A new study has now found slight differences in five amino acids in the HLA-B protein between long-term non-progressors and people who do not control HIV for longer than normal. You can read a Reuters report on the study here. These two videos from AIDSVideos.org do a good job debunking some of the myths about HIV tests and about HIV/AIDS. What was Anthony Mbewu's role in the collapse of the Global Forum for Health Research? Poor countries striving to improve their health systems deserve better than the unexplained implosion of the Global Forum for Health Research, argues Beverly Peterson Stearns. Barely a year ago nearly 1,000 people from 80 countries gathered enthusiastically at the Palacio de Convenciones in Havana, Cuba, under the banner 'Innovating for the health of all'. More than half came from low- and middle-income countries. They were attending the annual meeting of the non-profit organisation the Global Forum for Health Research (GFHR), eager to hear about inventive and effective ways to conduct research, and urgently seeking to improve health in their countries. Now, less than a year after taking office, the forum's executive director, Anthony Mbewu, has resigned, and the forum itself is in failing health. The prognosis is poor. Very few remain in its Geneva secretariat. Many employees have quit, been fired, or have retired early. A large number of organisations and individuals have signed this letter to the WBAI management asking them to reverse a decision to restore supplement-entrepreneur Gary Null's show to WBAI radio. You can sign on by emailing [email protected]. We are writing as individuals and organizations who are deeply distressed by WBAI's recent restoration of supplement-entrepreneur Gary Null to the airwaves of WBAI Radio five days a week. We are gravely concerned about this prospect and the consequences for people at risk of and living with HIV. Mr. Null and his frequent radio guests support the notions, among others, that HIV does not play a role in causing AIDS; that the disease is not transmitted sexually or via dirty needles; that HIV tests are meaningless; and that antiretroviral drugs are not only poisonous but can actually cause AIDS. Legitimate concerns and grievances about the pharmaceutical industry are eclipsed and diminished by this life-threatening stance. The spread of false claims about HIV and AIDS is deadly, and particularly harms the poor communities of color most devastated by HIV/AIDS. Disinformation about HIV has caused the unnecessary suffering and death of an estimated 300,000 men, women and children (see http://www.guardian.co.uk/world/2008/nov/26/aids-south-africa ). Both the existence of HIV and its role in the causation of AIDS has been amply demonstrated (see, e.g., www.aidstruth.org). Among the destructive effect of spreading these falsehoods is to reduce condom use, increase infection risk and dissuade people from the use of life-saving antiretroviral therapy (among other modalities). We respect the station's longstanding free-speech tradition, and support open debate on critical public health issues. We also deeply appreciate the fiscal difficulties facing WBAI and the Pacifica network. However, the notion that WBAI's survival is dependent on relying on Mr. Null while spreading a message of death is antithetical to the mission of the station and of the Pacifica Network to which it belongs. We call on WBAI management to immediately reverse its decision to add Mr. Null's program to its schedule. OPINION: Doctors call them Thabo’s children – the thousands of kids infected with HIV by their mothers at birth who still fill hospital paediatric wards, suffering from a range of debilitating infections. When many of them were born, they did not get antiretroviral medication that could have prevented their mothers from passing HIV on to them. This was because then-president Thabo Mbeki had decided that ARVs were “toxic” and somehow less desirable than a fatal, incurable virus. But by 2000, at the height of Mbeki’s AIDS debating society, four independent studies had shown that two ARVs, AZT and nevirapine, could cut HIV transmission from mothers to babies by up to 50%. It is well documented that some 330,000 people died under Mbeki’s watch because his government delayed the introduction of ARVs. What is less known is that Mbeki’s refusal to accept that AIDS was caused by a viral infection caused his government to under-fund health services at the very time that hospitals were starting to see a surge in AIDS patients. They closed nurses’ training colleges and flat-lined health budgets to save money, hastening the collapse of health services that we see today. Scientists can be elitist and patronising. In that way, they are no different to any other people with power, including some traditional healers and including people who defend science, like myself. There are multiple knowledge systems. Cultural diversity, including African culture, is a valuable treasure. Traditional medicine is used by people across the world. African traditional medicine, in particular, is used by millions of people across Africa. It is therefore important to build relationships with traditional healers to ensure that their patients receive appropriate care. Many organisations, such as the Treatment Action Campaign (TAC), attempt to do this, with varying degrees of success. Achieve, Spring 2010. Reprinted with permission from Achieve. ETV is promoting quackery by airing Christ Embassy’s weekly info commercial at 7:30 on Sunday mornings. During the commercial the pastor who runs the church claims to faith-heal a number of diseases including cancer, heart disease and arthritis. Christ Embassy's website claims that Pastor Chris Oyakhilome, the proprietor of this church, can faith-heal HIV. ‘ETV's 3rd Degree has been outspoken against AIDS quackery and denialism and so it is disappointing that the station runs Christ Embassy adverts, which are quackery and a threat to public health,’ says Nathan Geffen, TAC Treasurer. Many religious organisations are playing a critical role in the fight against HIV and TB in South Africa, raising awareness, providing spiritual and emotional support to people with these conditions and thereby helping them to adhere to the medications which cure TB and suppress HIV in the blood to restore people's health. We recommend this article, "Conspiracy theories in science" by Ted Goertzel in EMBO reports. Conspiracy theories are easy to propa­ gate and difficult to refute. Fortu­ nately, until a decade or so ago, few serious conspiracy theories haunted the nat­ ural sciences. More recently, however, con­ spiracy theories have begun to gain ground and, in some cases, have struck a chord with a public already mistrustful of science and government. conspiracy theorists—some of them scientifically trained—have claimed that the HiV virus is not the cause of aiDS, that global warming is a manipulative hoax and that vaccines and genetically modified foods are unsafe. these claims have already caused serious consequences: misguided public health policies, resistance to energy conservation and alternative energy, and dropping vaccination rates. Read the rest of the article (PDF). For adults with human immunodeficiency virus (HIV) infection who have CD4+ T-cell counts that are greater than 200 and less than 350 per cubic millimeter and who live in areas with limited resources, the optimal time to initiate antiretroviral therapy remains uncertain. The paper that cost the editor of Medical Hypotheses his job will have no further consequences for its main author, molecular virologist Peter Duesberg of the University of California (UC), Berkeley. The university has ended its misconduct investigation after concluding that Duesberg was within his rights when he wrote that there is no evidence of a deadly AIDS epidemic in South Africa. Duesberg's paper, published online on 19 July 2009, triggered a storm of protests from AIDS scientists and activists. Elsevier, the publisher of Medical Hypotheses, has retracted the article and has terminated the contract of the journal's editor, Bruce Charlton of Newcastle University in the United Kingdom, who declined to introduce a peer review system at the 35-year-old journal. 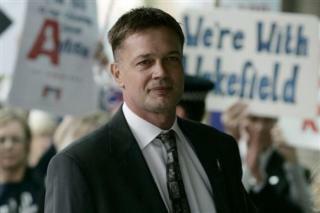 Andrew Wakefield, the doctor at the centre of the MMR scare, has been struck off the medical register after being found guilty of serious professional misconduct. He was not at the General Medical Council (GMC) hearing to receive the verdict on his role in a public health debacle which saw vaccination of young children against measles, mumps and rubella plummet. The GMC said he acted in a way that was dishonest, misleading and irresponsible while carrying out research into a possible link between the measles, mumps and rubella (MMR) vaccine, bowel disease and autism. AIDS denialist and U.C. Berkeley Professor Peter Duesberg has recently received media coverage following the withdrawal of a paper of his by the publisher, Elsevier, and an investigation into his conduct by the University. Here, we provide some background and a timeline of events in the unfolding drama.